Detailed description of the Market Direction Predictor. How does the Market Direction Predictor work? Who can benefit from the Market Direction Predictor? Where do I need to start? How can I learn to use the predictor? What is the potential profit, and Win / Loss ratio using the Market Direction Predictor? Risk that you need to be aware of, when using the predictor information. Market Direction Prediction VS Trading Signals. The Market Direction Prediction Page, and the interpretation of the data published. How many predictions presented during a specific period, and how does the predictions scheduled? The evaluation of a specific prediction. Market days currently Not trading with overnight positions, or trading with limited exposure. 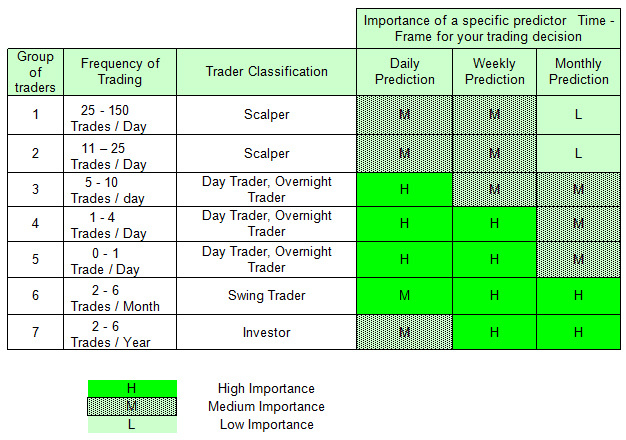 Trading, using the predictor information for opening overnight position. Some other techniques to increase our success rate even more using the predictor. 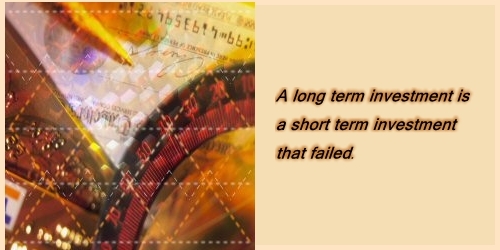 The importance of a specific predictor time frame for your trading or investing decision. The description of the way, we use the predictor for trading. Prediction classification (grading levels) used to bracket every prediction into any of the following five states. Building strategies based on the predictor information. For sure any institution which have very complex computer systems to get ahead of the competition in the markets keep those strategies as top secret for ever. Before started the design of our system, we studied many books and other sources about the stock markets, but we have to say that it was our trading experience and our dedicated research for many years that led us to the creation of the predictor. The predictor strictly speaking is the professional implementation of a technology created and implemented by traders and programmers. It is especially useful to support trading decisions on multiple time frames. The designed technology is also expected to be valid for very long time for the markets and serious considerations were taken during the design and implementation in this respect. The technology is based upon a complex set of rules that the designers considered very important for trading and could be considered as axioms. To find a complex set of rules that could be applied generally to the market is a huge project and necessitates many years of extensive dedicated research. The difficulties lie in the dynamics of the market, as the importance / weight of rules often changes dynamically. The best to envision the predictor is like a strategic game program, similar to Chess programs. Actually the inventor of the core predictor technology played chess in his early years. He was not even 14 years old, when he managed to beat the third place adult European Champion in the game. The predictor design draws upon the design and implementation of chess programs. Even after thousands of predictions, the designers are not able to tell in advance just by looking at conventional market – related information, what the predictor will suggest, even though after a couple of month we can have some kind of feeling about the coming prediction about 30 - 40% of the cases. The key focus is to interpret the predictor data the best way possible. The predictionwizard.com help us gauging the general market for the next Day, Week and Month. On the other side the predictor generates more than 100 data every day for the daily prediction of six US indices, that is interpreted and analyzed automatically by the system and a grading process applied to come up with the final predictions. Some of the additional conclusions / interpretations will be delivered to the users of the predictions as comments in addition to the predictor information for each of the six US indices. These additional comments are not automatically generated. Originally the developers used the predictor to support Day-trading, overnight trading and swing trading activity. - Investments in Index-related asset classes. - Swing-trading in Index-related asset classes. - Day-trading in Index-related asset classes. - Overnight trading Mixed with investments or long-term trading. - Overnight trading Mixed with Day – Trading. - Other combinations of the above. The objective was during the developments of the predictor to increase our yearly profit by allowing our trading capital to work for us 24 hours a day every day of the week and every week of the year. As we mentioned all kind of trader can benefit from the predictor, but the achievable profit potential (And with it the loss potential too.) increases, as the intensity of trading increases. We enjoy the benefit of Mixing the overnight trading with active Day-Trading. But we should note here that overnight trading alone present a possible profit potential, which is considerably bigger than the investment potential on a yearly basis. Users can come from those traders, who are doing trading in index – related asset classes (Stocks, Options, futures…) or stock trading which have high correlation with indices on a given business day. We would like to highlight here that any given time during a trading day about 40 to 100 % of stocks are highly correlated with the indices, and the more pronounced the movement in the index, (The bigger the movement in a shorter time period.) the bigger the correlation of most stock movement with the index. We also note that this predictor information is best for experienced and professional traders, who already have trading experience. We are not saying that beginner traders can’t benefit from the information. Of course the predictor could turn many less experienced traders into winners, but since the information is not a Buy or Sell signal, only those, who can make the proper decision on a timely fashion will benefit the most. Without additional analysis, strict risk control, position management the gains could be considerable less, than the maximum potential. There might not be a general solution for this for everybody. But the first starting point should be to study the learning material, presented on the site. Than you will have a much better understanding about the predictor. With that in your baggage, you can create you own development plan and you can proceed with your own pace. Nobody learned playing chess overnight. It will take time. Time that very well spent. Viewing the predictor performing is definitely important. You need to get accustomed to the different direction information for different time frames, and the dynamics of those playing out. It is very important to check a lot of charts. Since the predictor information is mostly correct, it might be better to reverse the course and check all charts when the predictor information did not play out to be a winner. Deeply analyzing those occasions on intraday basis and within the context of a higher and lower timeframe could give valuable information during the learning process. You need to have a feeling after a certain period that a certain prediction is correct or not and reach that conclusion sooner in order to maximize the potential and if necessary flip positions quickly and early in the trading session. The more you would like to benefit from it and the more you plan to rely on it the more time needed with analysis. If you plan to take it as a second or third confirmation, than you might not have much time to discover all the details. We would suggest not to rush into a quick trading mode or strategy creation mode until a very good feeling for the predictor performance reached. It will probably happen after 1 - 6 month, depending on previous experience and time allocated to the discovery process. Success does not come without knowledge. Real knowledge means confidence. Real confidence will not come overnight, so you need to be patient a bit and flexible to handle all possible situations on the market properly. The predictor is only a tool to extend the capabilities of the trader or investor. That does not mean everything becomes certain and not governed by probabilities. Have a good luck and enjoy your journey. Potential profit using the Market Direction Predictor is higher than any competitive service or signal we know of, in the area of index–related trading. It is not a pure Buy / Sell trading signal, and also need a bit more knowledge, learning to be really successful with it. The market direction predictor does not generate signal to open or to close the positions, it must be completed by the trader or investor after a series of considerations. 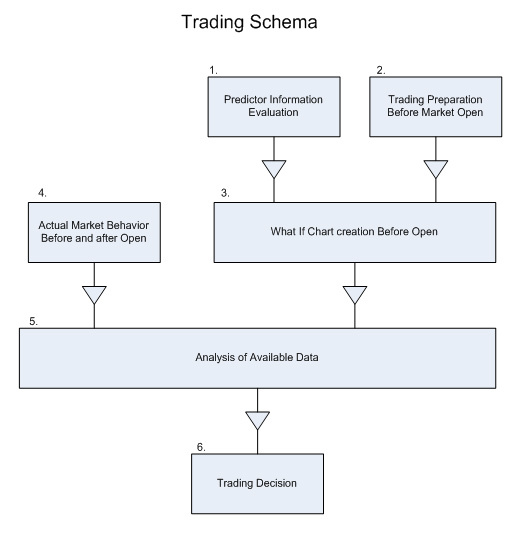 Since based on the predictor information still unlimited number of strategies could be applied and the experience of the trader is also very important, it is impossible to define profit targets in advance, without the knowledge of applied trading strategy, the trading asset class, the accepted risk, position management and many other parameters. But to help traders in this learning and Market Direction Predictor evaluation process, we prepared a few examples about the Maximum possible Win/Loss ratio, that could be achieved with a lot of trading experience and market knowledge, once the trader opened a Long / Short position in the index-related asset, before the close of the business day. Another strategy, when the position is NOT opened before the close of the markets, so that overnight risk is not applied, could also be implemented, but according to our experience, a little bit better profit potentials could be achieved, holding the index-related asset overnight, since some of the biggest moves in the markets usually happens overnight but that might be achieved only by accepting the higher overnight risk with our position. To illustrate the differences between potential profit targets, we show three examples. 1. If the trader is fairly conservative, allows a small stop and trades the NASDAQ100 index – related ETF shares (QQQQ) than about 0.4 - 0.6% average profit on a trade might be acceptable and good results depending on market volatility. Similar ETF for the S&P500 index is the SPY with considerable liquidity. Many similar index following ETF-s available for all kind of indices to play. 2. If another trader, who is willing to take a bit higher risk and play the other NASDAQ - related asset, like the QLD, Ultra Long proshares or QID, ultrashort proshares, which have a much higher intraday trading range in terms of percentages than the QQQQ, (About the double of the QQQQ risk.) average daily profit of about 0.8 - 1.2% might be a nice gain. Not to mention that even bigger profit is possible sometime. 3. If all this is not enough, than the trader might want to play for example the more risky Options or the index futures, or other derivative asset class like CFD-s (Contract for difference). But we definitely would not recommend this for the beginner. Only the most experienced players might accept such a risk and stay consistently successful, and even those only with a limited portion of the available trading capital. Trading options, futures or other leveraged instruments carries much higher risk than trading simple ETF-s only. It is not impossible to see above 10% gains or losses a day sometimes trading those risky instruments. The Win / Loss ratio achievable using the predictor will be different for all three predicted time frames, and it will be a little bit different for all indices. We present the potential Win probability for each prediction. It means optimal Win probability. That Win probability could only be exceeded only if the player learn to identify false / incorrect predictions very early in the prediction period correctly and reverse positions accordingly. We give some support in this area for the predictor users. The actual achieved Win probability will be a little bit different for predictor players, even if playing the same index and same time-frame, as it will be dependent on trading experience and predictor experience. Assuming that we present Daily Index predictions with 75% average optimal win probability, it is acceptable to have actual results from a beginner to novice trader in the range of 60 – 65% win ratio, actually playing those predictions. A more experienced player will be able to play the same predictor information with a 65 – 70% win probability, and a top pro will be able to make 70 – 80% win probability or even more from the same predictor information, by reversing positions after early identification of incorrect predictions. These numbers are for the players who plays the Daily predictions on intraday basis or overnight basis. Players of longer time frames potentially might be able to achieve much better win probabilities on average, as the Weekly predictor optimal win probability is better than the Daily predictor win probability. All time frames are different. The shorter the time frame, the higher the stress that comes with the trading and position managements and the more experience required to be consistently profitable. It is generally easier to make consistent profit on the swing trading time-frame, than it is for Day trading time frame, especially for beginner traders. The optimal win probability statistics will be detailed in the predictor statistics section. Every kind of trade carries a certain risk. It is generally true, that a professional trader, who is willing to take bigger risk, will be rewarded with bigger profit. A scalper may not even accept a 0.2 [%] risk on a trade, doing the trade with a big position size. The larger the time period, the trader is willing to hold the asset, the greater the risk that need to be accepted to be a successful trader. Sure the overnight risk can’t be controlled 100%, since unexpected external events could have meaningful impact on the markets. Just to think about the worst possible scenario, terrorist attack could hit the economy, bombs could fall from the sky suddenly somewhere in the world or mother nature could cause unexpected damages overnight. The potential impact of these catastrophic events might be that US indices open 4 - 6 or even 10% down the next business day. But the probability, that such an event occurs is extremely low, and it doesn’t happen every month, maybe once in 10 - 50 years. If the indices drop a certain percentage during a business day, than the trading halted temporarily to give some breath to the market participants to reconsider their position. Even if the worst happens, a 5 - 10% loss could be recouped by trading in the following 1 – 3 month, or even sooner, depending on the aggressiveness of the trader. 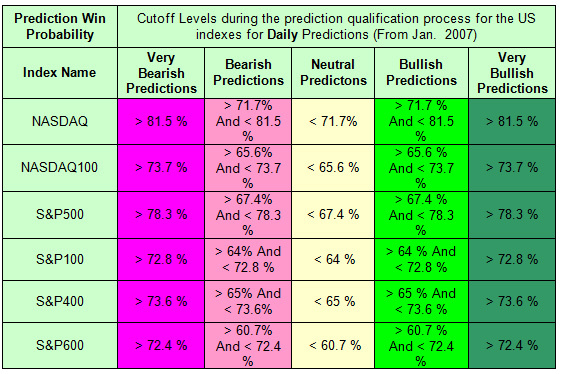 During 2007 for example the predictor direction was in line with the biggest gaps of the year, as 12 out of the biggest 14 gaps occurred in the direction of the predictions. During the time period between April 2008 and Jun. 2009 (A total of 15 month period) the predictor direction was in line with the overnight gaps about 52% of the cases. Overall it could be stated that the predictor is not predicting the overnight gaps, it is predicting the movements during regular hours. We note here that some of the biggest GAPs occurred on Mondays. If we hold positions during the weekend that carries added risk. Some asset classes might be better in this respect, those that are traded during the weekends, so we might be able to limit our losses during unexpected situations. Because of this the strategy designed around the predictor must be a bit different if positions held overnight. In this calculation we did not consider predictions for other indices, or weekly prediction or monthly prediction or other market dynamics, like short-term, medium term and long term trends of the market. By taking all those into account the surprise gaps against our overnight positions could decrease meaningfully, but never could be eliminated. We stated that the predictor is NOT a trading system itself as it does Not specify what kind of asset to trade, what size of position to take, and specifically when to enter / exit those positions. Any specific trading system could have a relatively high win rate, as it strives to catch only the highest probability entry / exit points for profitable trades. But we know that the market have different periods, when it is trending and when it is not trending, when it is volatile and when it is not volatile, when it is doing only internal sector rotations, when its move could be better predicted and when its direction could be predicted will less probability. It is much more difficult to create a general solution which works for every type of market, every cycle and every time period fairly well. During the design and implementation of the technology we use we tried to build the system on rock solid foundations. Those foundations were the axioms, that proved true for the markets during the past 30 years. There are beliefs. We do not built our system on common beliefs. There are a lot of common beliefs, that are simply not true, and especially not valid on a longer term, basis. We built our system on thoroughly tested axioms that proved to be true on very long term basis. For this reason we did not implemented special tuning within the system to make it more reliable during any specific period, be that any kind of market. The very long term stability was a higher priority during the implementation of the system. For this reason it is wise to make the special kind of tuning within the strategy, that we build around the predictor, knowing its strength and weaknesses. The registered users will have access to the Market Direction Prediction Page. Each index direction predicted on three different time frames, Daily, Weekly and Monthly timeframe. At any specific time, when the predictor information is refreshed on the web site, it is refreshed for one specific timeframe, and refreshed for all six indices at the same time. For any specific index the prediction on a time frame contains a color code, and the potential win probability for that index. The color code is actually used to make it possible to quickly get the overall picture for the indices. In our historical data (Which can be downloaded from the web site) we coded these color codes as 3 (Very Bullish), 2 (Bullish) +1 Neutral (Still leaning to the Bull side.) -1 Neutral (Still leaning to the Bear side.) -2 Bearish, -3 Very bearish. We also present the potential Win probability for each prediction. This can be used to support us further in our decision making process. The win probability is calculated using a rolling three year period, (The last three years.) and comparing the predictor data to similar internal prediction data in the past. A higher win probability does not mean, that the potential market move is bigger. It only means, that the win probability is better for the predicted period. For every Day we have more than a hundred calculated Daily prediction data available for the US indices, but we do not intend to make life complicated, so we created these simplified presentation to the registered users. The interpretation of the predictor data is fully automatic, no human interaction is used to present the predictor data in the prediction table. But be careful, as those cutoff levels vary index by index. To be in the top 15% category, the potential win probability must be much higher for the NASDAQ prediction than for the SP600 index for example. The average win probability is different for each index, but it is the highest for the NASDAQ and for the SP500 indices. It is very important to read the comments, that we publish for the predictions. It is Not automatic, as it is the interpretation of the operator, but might contain very important additional information, that might not be noticed otherwise. It is based on the interpretation of the full predictor datasets and other market analysis. Occasionally we get conflicting data, so-called internal divergences, but we still need to present the prediction as one of the above described six state. Sometimes the additional data suggest stronger or weaker next market open and potential turns during the next day. We also comment in situations like that. On the page you will find additional information about the Date and Time of the predictions. It is important to know, how old is a specific prediction. If a registered user logged into the system, and viewing the predictor page and in the meantime the content of the predictor page changed, than the page of the viewer automatically refreshed with the new predictor data, and if the user selected that option, than a sound signal will accompany the automatic refreshing. The sound signal can be changed or deselected using the "Modify" link next to the username after login. Assuming that we have a month with 22 market Days. That is a bit more than 4 weeks period. During this period we will present approximately 22 * 6 * 2 = 264 Daily predictions. One Daily prediction before the market close and one Daily prediction after the market close for each of the six US indices for every Day. On some days we might even present two sets of daily predictions before the market close, If the first set of predictions calculated early in the afternoon, say 3.00 – 3.15 PM, and the predictions change considerably before the market close, by 3.45 PM. We might run the predictor calculations earlier if we see little probability of a complete change, even if the market changes direction and reverse course a bit late afternoon. The Daily prediction for the next day might be different before the close and after the close, even though most of the time it will be the same or similar. Market action after running the predictor calculations might change the whole picture, if big change occurs from the first prediction till the market close. We saw aggressive buy or sell programs kicking in full speed after 3.35 PM ET or later, that changed the whole daily picture, but that does not happen many times a year. The more we wait to run the predictor, the better our next day prediction might be, but might also lose out the possibility of a good entry for a potential swing trade or overnight trade. So there might be a good compromise between these opposing requirements. The most probably Daily prediction schedule will be between 3.30 – 3.45 PM ET. We completed exhaustive research for the last hour of the market day to help us identify the optimal timing of predictor calculations depending on market action. In a six month period after opening overnight position, the position was in the red only about 15 % of the cases by 4.00 PM ET, but had to get out of the position before the market close only twice during that period due to complete changes in the predictions by the close. The market moves in the predicted direction by the market close much more than 50% of the cases. In addition to the Daily prediction we present 6 * 5 * 2= 60 Weekly predictions, as the period contains four and a half weeks, so we present 5 *2 weekly predictions at least for every US index. 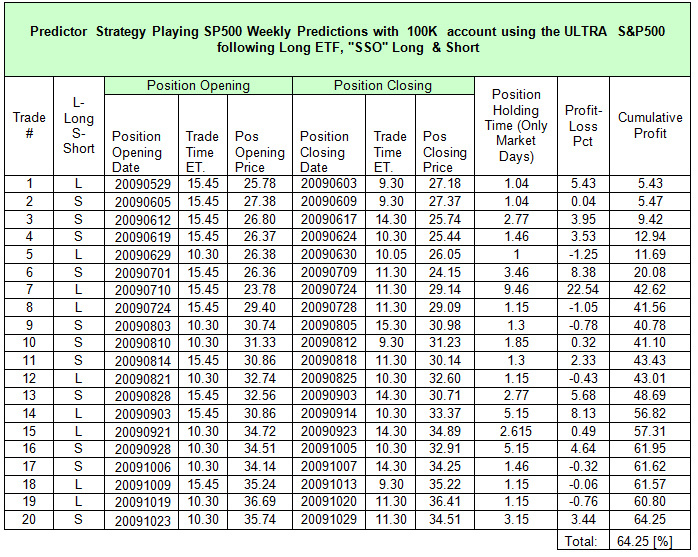 Similarly to the Daily predictions we run the weekly predictor calculations before the end of the current week first. That is usually on Fridays, before the close. After the market close on Friday (Assuming that Friday is the last trading day of the week.) we run the calculations again either on Friday or Saturday to get the final weekly predictions for the next week. And finally we present 6*2 monthly predictions during this time period. Using similar logic, we run the monthly predictor calculations before the end of the month first, (Usually the last trading day of the month.) and we run the monthly calculations again after the market close of the last Day of the month to get our final monthly predictions for the next month. So the total predictions during a 22 Day month will be about 264 + 60 + 12 = 336 predictions. To make this happen we strive to do everything possible but we also know at the same time that many systems need to work flawlessly to present all these predictions without any interrupts during longer periods of time. We also note that we run the predictor calculations some other times during the day and week and month , but those results are for internal use and we might use those only to add comments to our Daily, Weekly and Monthly predictions and as early warnings if weekly or monthly predictions change during the prediction period. As we are moving ahead and complete additional developments, we try to present additional information to our subscribers. 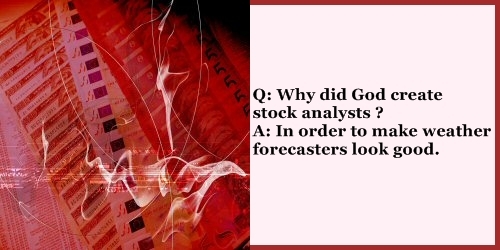 The timing of the predictor calculations vary day by day a bit, as it is dependent on market action. If the market is currently moving dynamically, than we usually wait a bit longer, and if the market is in a slow mode, than we usually run the predictor calculations a bit earlier. The first Daily predictor calculation and the forthcoming updates on our portal will be between 3.00 -3.55 PM ET. Unless we experience technical issues with any of our systems, we will not run the calculations later than that. Just to speed up the information flow of the predictor calculations, we might not comment those Daily predictions immediately, or might add some quick comments after the automatic portal update, which is initiated by the administrators. After the market close we will run the Daily predictor calculations again, usually within 10-30 minutes, but if for some reason it is not updated, it will be updated before 7.00 AM ET on the next day. Assuming that the current day is the last day of the week, than we plan to run the weekly predictor calculations just before the Daily predictor calculations, that means sometime between 2.30 - 3.15 PM ET. Again, we might not comment the weekly predictor results immediately as our priority is the time, to get the objective calculation output to the portal as soon as possible. If we think that the weekly prediction calculation probably will not change considerable during the Friday afternoon, than we might run the predictor calculations and present to our subscribers as early as 14.00 PM ET, leaving more time to prepare and react to the developments. If the weekly predictions changes however before the market close on Friday, than we present those again before the market close. Similarly the schedule of the monthly predictor calculations first on the last business day of the current month. If it is also the last day of the week, than we run just prior to the weekly predictor calculations, which means sometime between 2.00 -2.45. PM ET. If the last day of the month is not the last day of the week, than we run the monthly predictor calculations sometime between 2.30-3.15 PM ET, just before the Daily predictor calculations. Normally a round of predictor calculation and portal update will be completed within 10 minutes. The portal update after the predictor calculations completely automated, but the process must be initiated by the portal administrators. These predictor calculation schedules designed to help our clients to get a better edge and get it ahead of the competition. When we try to solve the puzzle, that the stock market presents to us we need to put al the pieces of information together. It is extremely difficult to recognize a 100 pieces puzzle picture just having one piece in our hand. But having at least a bigger chunk of those pieces put together even a less experienced player might be able to recognize the true content. Having the predictions for six major US indices on three time frames all together gives us a bigger portion of the puzzle to make us potentially more successful recognizing the market puzzle. 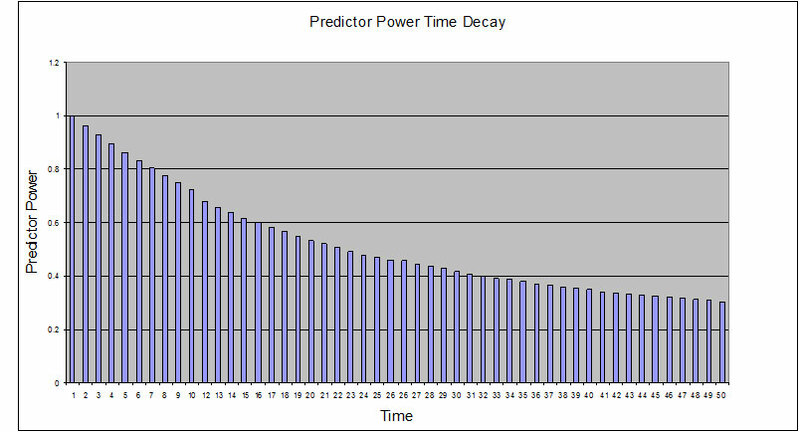 The predictor power is not a number itself, but a Function, that dependent on time. The predictor power, which is closely related to the effectiveness of a specific prediction is the highest at the time of the prediction, and that power decreases over time. The starting value is one, the maximum at the time of the prediction. Then we have the highest probability, that the market will go in the direction of the prediction. As the time passes, we have decreasing predictor power, which means, that the probability, that the market will go in the direction of the prediction is less and less as we approach the end of the prediction time period. The decrease is not linear, it is decreasing more quickly than the linear function. This means for example, that having a Daily prediction for a specific Index we expect the move to happen with the highest probability during the beginning of the market day, especially during the first 30 – 60 minutes. If for whatever reason the market does not show any willingness to follow the predicted path relatively quickly after open, that also a valuable information, and might mean that considerable impact reached the market after the prediction date / time or before the market open on the next day, or immediately after the open. So for a Daily prediction the predictor power is 1 at the market open, and it is below 0.5 at half time, after 390 / 2 = 195 minutes of regular market time for the US markets. If the market does not follow the weekly prediction path during the first 1 – 3 days of the week, we have decreased probability, that the market will go in the predicted direction during the rest of the week on Thursday or Friday. For the monthly predictions the same could be stated. The weight of the monthly prediction should be higher in our decision right after the prediction published, and early in the month, and decreased weight in our decision during the second half of the month. The best point of time in this respect, when all predictions are fresh is the first weekday in a new month, when both the daily, the weekly and the monthly prediction are fresh. The time presented on the horizontal axe on the chart is a relative time, 50 being the maximum of the prediction time frame. It is common to see predictions on one time frame point to different directions than predictions on other time frame. We need to weight those according to the time frame we are intend to use. It is very interesting to see the market to resolve those conflicting predictions on the different time frames. Short term market turns best could be detected by using the Daily market direction information. Having the predictor power notion in our hand before each business day we can make a estimate about the weight of the available predictions, based on how old a specific prediction. We decreased the weekly prediction weight considerably as we are just ahead of the last trading day of the week, and also decreased the monthly prediction weight as we are approaching the end of the month, so the monthly prediction is not really new. It is wise to consider not only the prediction data available, but also the date / time of the predictions and making adjustments based on how old a specific prediction is relative to the prediction period. After the end of a specific prediction period we evaluate every specific prediction and make our conclusion. Any prediction can be either Correct or Incorrect (False) prediction. To help you understand our evaluation better we introduce the notion of profit zone and loss zone. A specific prediction is in the profit zone, if we could make a profit by closing our position at that time, for example a Long position is in the profit zone, if the Index we are playing is Up relative to the level the index was at a time we run the predictor calculations. For the sake of simplicity these reference levels are the Daily closing levels for the Daily prediction, it is the Friday’s closing level for the weekly predictions (Or the closing level on the last trading day of the week.) and it is the closing level of the last trading day of the month in case of the monthly predictions. We do not require for a specific index to reach a specific profit level by a pre-specified time within the prediction period. So we do not require for example for the Daily predictions to reach the 0.8% profit zone within 5 hours in order to conclude that the prediction is Correct or Incorrect (False) prediction. We examine the charts, the index movements during the prediction period. We require for the index to stay in the profit zone during the prediction period for a minimum of time. That minimum of time can be as small as 5 – 15 minutes during a Day, if it is in the early period of the prediction. Having a professional level of trading knowledge and predictor knowledge and experience the player should be able to get a profit during the prediction period having optimal execution in order to specify as Correct. The profit zone that is required from a specific prediction will depend on the prediction itself. If the trading range for a specific prediction period is extremely small, than we just require the index to stay in that profit zone for a minimum of 20-30% of the time of the prediction period. If the trading range is not that small for the specified prediction period, than we require for the index to make a minimum move into the profit zone, depending on the time-frame we predict. It is definitely depend on the Volatility of the indices, but during average volatility in 2009 year we used the following levels for the US indices for example. For the Daily predictions we required a minimum of 0.3 – 0.5% moves into the profit zone in order to consider the prediction correct. For the Weekly predictions we required a minimum of 0.7 – 1% moves into the profit zone in order to consider the prediction correct. For the Monthly predictions we required a minimum of 1.5 – 2% moves into the profit zone in order to consider the prediction correct. Over time these levels might need to be adjusted according to market volatility. (It might be fine, when the VIX is between 22 – 35 levels. We need to think with the head of the intuitive trader playing the Daily predictor information. If on a given day the index moves into the profit zone, reach the 0.5% level there, but stays there only for 5 minutes at the end of the market day (Like spikes, induced by big program trades) than we will consider that prediction a failure, as the individual trader probably might not be able to profit from the move. On the other side, if the index reach the 0.5% profit zone at the beginning of the day, and stay there for 10 – 15 minutes, that should be enough for a good, experienced trader to get out of the trade with a profit, and do not let that become a loss for the day, in case the index makes a sudden reversal and moves the position into the loss zone. It is a bit subjective evaluation. To get a better feeling about correct and Incorrect (False) predictions we strongly advise to study the prediction charts that we present for the predictions for each indices predicted. Those can be reached from the Download section of the predictionwizard.com site. We marked the Incorrect predictions on our prediction charts with “F” letter (False). Those chars also useful to get the feeling about success rate for the predictions and we could also see the lover probability predictions and the higher probability predictions and their places, relative to index levels and movements on those charts. 1 Knowing When to open position. 2 Knowing when NOT To Open position. We collected some info about potential impacts on the market before the open, that could derail it from the original course considerably. Some of these are the following. - FOMC rate decision days, and days, following the rate decision. The most risky is the day after the rate decision. The second day after the FOMC announcement might be played with less risk if the predictions are strong and the FOMC decision is in synch with the market expectations, and not deviating from that. - GDP data arriving to the market, before the open. Especially when “Final” GDP data coming to the market. - PPI data arriving to the market before the open. -Other economic data arriving to the market, that supposedly key to the evaluation of real value or deemed crucial for various reason, and coming to the market. - Beginning of the Profit reporting periods. Not suggested to trade the first 2 – 3 weeks of the profit reporting periods with overnight positions. These days can carry greatly increased risk, especially for predictions against the current direction of the prevailing trend. (Assuming that the market is trending). From all four quarters of profit reporting usually the most important from predictor’s perspective is the first quarter. Companies express their outlook for the whole year during the conference calls after the reporting and that might be catalyst to considerable re-pricing of equities. Some companies might have bigger impacts than others. We watch especially the biggest 6 – 15 companies from the NASDAQ100 and SP100 and when they report, we are not playing overnight positions for the specific index. - In addition to the above mentioned economic data we suggest not to trade the Bear signals (At least not during in a Bull market) that we are getting on Friday, before the close or before a longer Holiday. This is more valid for shorter-term positions, like positions held until the next Monday only. The reason is that some statistics suggest, that market participants might change their view on the markets in longer period, like a weekend, and not necessarily starting the new week selling stocks like crazy. So we would rather wait, and play the predictor direction only after the next open, if see real-time confirmations of our predictions. We also consider the predictions on all time frames on Fridays. If the Daily and the Weekly prediction points to different direction for the next Monday, than we usually do not initiate overnight position on Friday. We also consider possible divergences between the different indices. If for example the NASDAQ prediction points to different direction than the S&P500 prediction than we definitely take a closer look into the numbers before stepping in with any positions. If the Daily and the Weekly prediction points to the same direction simultaneously for multiple indices, than we feel much more confident to take the risk even for the weekends, till next week. at all 70 – 80 days or about 30% of all days using overnight trading positions. (But we might have longer term swing trading positions.) We usually play the market starting from the next open on those occasions. Another note to consider that the computer need to differentiate between numbers to make the distinction between Bullish and Bearish calls, Sometime the calculated numbers are at the borderline between the Bullish and Bearish classification. In these cases we usually add special comments to the predictions to help our subscribers in the decision making process. Though we might not be able to estimate precisely the impact of all economic data in advance, the above mentioned items could easily move the indices 0.5 - 1% or even much more within the first 30 minutes after hitting the wires. These are the occasions, events that has the potential to reverse the signal direction immediately, so we could call them potential reversal events. We also note here that even if some days are not played, we calculate our predictor statistics in a way that all days included, no matter if we have profit reporting, GDP, PPI, CPI or any other economic data scheduled after the current daily market close or before the next day open. On the other side so far at least the predictor generated winning directional information even for those GDP / PPI / CPI periods well above 50% of the cases, probably because the biggest players who moves the markets, has really good predictive methods for those data, and that shows up on the market and the stock index predictor. If any central banker or the FED chairman present his view on the economy before congress or anywhere else, the information, delivered could also have a meaningful impact on the markets, since monetary policy or insider view on economic conditions might force the revaluation of stock positions held by institutions. But those appearances usually occur during market hours. During profit reporting season some of the biggest players of the market might also derail the indices quite a bit, if they report results, that is quite different from the expectations. If playing the NASDAQ index, or related assets we are Not opening overnight position If we get a Bearish prediction in a Bull market, and any of the following big NASDAQ companies report profit before the open of the next day or after the close of the current day. We can call them Big Six pack, but we need to stay cautious if any of the biggest 12 - 15 company from the NASDAQ100 index report quarterly results and we about to play the NASDAQ or NASDAQ100 index related asset class. These are some of the biggest NASDAQ companies in terms of market capitalization and could be able to impact the index movement significantly. As one example, we got noticeable Bearish signal for Oct 26 / 2007 before the close of the market. We did not open short position, because Microsoft (MSFT) reported before the market open of the next day. After blowing away all expectation, the NASDAQ index opened up more than 2%. We capitalized on our bearish prediction by opening a short position after the open on the next day. Similarly If we are playing the S&P500 related assets, we are not opening short position, if we get a Bearish prediction in a Bull market for the following business day and some of the biggest S&P500 companies report their profits before the next day’s open or after the close of the given day. Even if we are opening a Long position for a Bullish prediction, we limit the size of that position, if big companies report. Also note that because of the inherent relationship between BIG Capitalization companies and the indices, some of the biggest S&P500 companies, which are Not NASDAQ companies could also impact the NASDAQ meaningfully in case of a big change in their valuation. But the effect of this cross-relationship (which could be quantified by calculating correlation for a given period.) is smaller. After a few month you will get a good feel for the predictor information and in time become more confident and successful in determining the proper action in different periods of markets. take the information and open position or not. Believe us, we had times, especially at the beginning, when we started to test the predictor, to take long positions, when it was pretty expensive or taking short positions, when it was already cheap. But over time, as we gained more confidence we learned the value of the information. We know that the odds are on our side. That doesn’t mean we are not taking into considerations other factors. Over the longer term the predictor beat our judgment consistently and we are confident it would beat most of the players (probably over 99%of them) on the market who are making individual decisions about the indices. Probably one of the greatest strength within the predictor is that it has solid objective opinion about the markets every time as opposed to our subjective feelings, sometime distorted sense of market dynamics. The predictor is handling the big picture and the small picture at the same time on a consistent basis. So assume 20 minutes before the market close we make the decision to open a Long position in a NASDAQ – index related asset. (Checking the economic news calendar we see no potential distracting news or other blocking information ahead of the next open. We use Bloomberg for this purpose. From that point on the objective is to open the Long position at the lowest possible price. To take the action immediately or wait depends on the current market action. If the trend in the past 1 – 3 hours is a strong down trend, then we have more time to wait for lover prices for our long position, since we would not prefer to close the day being in the water. In case of a swinging, range-bound market we just estimate the range based on the previous 20-60 minutes and make a limit order a bit below the current price. If not filled before the last 7 – 10 minutes of the market day, than we still can lift the limit price, or even sooner, if market conditions dictate. Note that we would NOT suggest to wait until the last 2 – 5 minutes of the business day to open our position, especially when having a strong signal. Probably large institutions, which have big financial models running during market hours, might also notice the strength or weakness in the market, that individual traders could not necessarily detect, and make movements in the market in the last 2 – 5 minutes. We noticed several time, that after we opened a Long position as a response for a strong signal, the index shot up quickly in the last minutes. Similarly found several times that the market declined in the last few minutes while we were in a short position. But also because of the confidence in the signal we were not distracted when we saw a bit bigger packets of shares going the other way, not in the same direction as our position, though we liked that less than the supporters. OK, now we are in position, ready to make our profit on the next day, at least that is what we are shooting for. After the open we focus on the developments and could see one of the following nine scenario. Suppose we have opened a Long position the previous day. If we have a GAP in the open, the second question is that the GAP is on our side, supporting us or against us. The opening GAP is on our side at least 50-52% of the cases (Which is the stat for the GAPs), but if not, than the management of our position will need even more focus on the markets. According to our experience a 0.4 – 0.5% GAP against the signal usually not a big hurdle, a strong signal still help us to make these situations profitable in most of the cases. If the GAP is like 1% or even more in the index against us having a strong Long signal, than the most important to find some compelling reason for the situation. It does not happen that often, but it could happen a few times a year. Most of the time big surprises, unexpected economic developments, international market developments or even political situations might be the cause of such occurrences, sometime in addition to the elevated volatility periods. If there is seemingly no strong reason for the big change, than our chance is better, that the market will move upward (In the direction of the prediction) in the beginning of the day. Whether we could make it a profitable trade or not, depends on many things, but we held such positions a few times for 0.5 - 2 hours, when the markets almost reached the zero level going upward, before turning down again. We still saw the impact of the strong signal that the predictor gave us the previous day. But do not hesitate if we have the valid reason, why the market has changed compared to the direction of the signal, and close the position if we have negative impact, that will not go away during the day. After closing the loser position sometimes we even open position in the other direction as soon as we detect, that the predicted direction does not play out according to our expectations. The experience is that if the GAP is less than 0.5% against us, than we still have fair chance of making a profit. It the GAP is greater than about 0.8 – 1% against us, than our chance to make a winning trade is relatively small, even though it occurred a few times in a year. But that will happen less often than moves on our side in the opening hour. If we have a 1% GAP on our side, also stay very focused, as sometimes institutions want to make a quick profit and pull the indices down first. It is not unusual that the index retraces more than 50% of the GAP Up, before turning upward again. So it might be wise to take at least partial profit for example in case of unexpectedly big GAP on our side, if the first meaningful swing of the market is against us. In some cases when those huge GAPs occur on our side we close part of the position even before the opening bell with the view that it could be reopened from lover levels later in the day. As we mentioned the impact of the Daily predictor signal is more pronounced and noticeable in the first hour of the business day. Most of the time we close at least part of our overnight position during the first 15-90 minutes after the market open. Considering the size of the GAPs the most often seen situation is when the index opening level is about the same as the previous day’s close, +/- 0.4%. Then we are in very good shape and having great chance of making a nice profit. In this case again the first 15 – 90 minutes will be crucial for our position, so we must stay very focused. General market parameters, like market breath, TICK, strong / weak sector analysis, relative volume in the markets and other parameters could also give us a clue about the state of the market. Obviously every successful trader has some kind of strategies that he / she refined over the years to make it more effective. Diagnosing the market as the doctors diagnose the patients is a common routine from the trader, and does that continuously as the day proceeds. Those market diagnosing techniques could be applied in parallel with using the predictor signal in our trading to open a position. But in addition to that we would mention some important factors. which is above our minimum required level to open a Long position. Fine, it will have a great chance to come out as a Winner. prediction value of the NASDAQ index, but also the prediction value of the S&P500 index and all other indices. If the predictor gave a strong signal also for the S&P500 index, than we have even better chance to profit from the trade. As our research shows, if we have some divergence between the NASDAQ and the S&P signal, than the winning probability decreases. 2. The other important aspects during the decision process for any positions is to know the surrounding support and resistance levels within the index. Analyzing these areas can give us another clue, whether to open a position with a given signal strength or not. Suppose we have a situation, when the market pulled down in the past few days, and we reached a point, when the first strong support level is about 0.3% below the current level and the second, even much stronger support level is about 1.5% below the current level Breaking the second support level would result in the break of a longtime market trend. In this situation we get a strong Bearish signal with 80% win probability. In this situation we would not necessarily rush to open the short position for overnight, but would be ready to jump in on the next day after the open, if the first support level is easily broken and other pointers would support that decision. On the other side we would have much less problem opening a Long position in a Bull market, being close to the longtime market high 30 minutes before the market close if we are getting a strong Bullish signal. Assume we had a Big Down day Today. prediction for the next day. If the prediction for the next day is Bearish, that would mean for the index a level below the current day candle body, so the signal point outside of the current red candle body, and not upward. If the index value is outside of the previous day’s range, than we might expect more decisive movement, so we will probably need to act more quickly. Conversely if after a long Bear day the predictor gives a Bullish signal for the next day, the index will probably move back into the previous day’s range. Usually in those situations we have more time to make the decisions about our positions. 4. Having the advantage of the quantified Market Direction Signal we could develop and apply a refined position management strategy, that fits the winning probability of the prediction and the given market conditions or market move that we experiencing. After a few months we might gain a nice feeling about the behavior of the predictor. If the predicted direction is aligned with the direction of the important market averages (Namely the MA10, MA20, AM34, MA50, MA200 of the daily charts.) than the odds of winning is a bit even better. The win probability calculation does not take into account all of the detailed results inside the predictor. If we have so called internal divergences or other uncommon situation, than we describe those in the comment section for the given predictions. 5. Stay flexible and sensitive to the market internals. The themes of the market is changing on a constant basis. So we need to stay focused and flexible to adopt to the changing market conditions. The predictor information will help in this area. Sometimes the big player prefer the small CAP stocks, other times they prefer the Mid Cap or the Large Cap stocks. favor companies doing most of their business outside of the US. Similarly the signal strength constantly changing for the different indices. There are periods, when the market favors the NASDAQ, other times the market prefers the S&P500 companies. If that “divergence” changes and the S&P500 becomes stronger for some period than using another trading vehicle, which mirrors the S&P500 performance might be more beneficial. If we stay focused we might want to change the asset type / category we are using as our trading vehicle. The objective evaluation of the predictor performance could be completed by the analysis of the downloadable historical predictions. The users can download historical daily, weekly and monthly prediction data for the indices on the download section of the web-site. Here we try to summarize some of the main aspects of the predictor. The data above includes all Bullish predictions, all Bearish predictions and all of the Neutral predictions, when we did not have internal divergences in the predictor numbers. If we got Neutral(+) than we added that to the Bullish prediction and if we had Neutral (-) prediction data we added that to the Bearish prediction. Eliminating all the Neutral data would lead to a bit better predictor performance statistics. The classification of this Upleg / Downleg / Range market for the above calculation results was subjective, doing it manually by taking into account some averages, namely the SMA10 and WMA10 and their relative positions, and their directions. The general rule is that Bullish prediction performance (Win probability) is a bit better in an Upleg than the Bearish prediction capability and vice versa, the Bearish prediction performance (Win probability) is a bit better in a downleg than the Bullish prediction performance. That is why it is useful to classify correctly the current environment. But there are some exceptions, when we had generally good performance in the other prediction direction, or sometime even better performance. For example between the 20070821 - 20071108 period, which was an Upleg, the Bearish prediction performance was a bit even better than the Bullish prediction performance. As we could see the Bearish prediction overall for the total time period, examined, has a bit better Win probability for the current data, but that is probably because the total periods, examined contains more Bearish period, than Bullish period. But for the less aggressive trader this might suggest to play with Long positions in an Uptrend If the prediction is Bullish, or open Short positions in a Downtrend only If the prediction is Bearish. The worst performance period of the predictor performance during the 29 month examined above was the 20080324 - 20080606 period (roughly 2.5 month), an Upleg, a few month before the start of the recession in 2007 Nov. 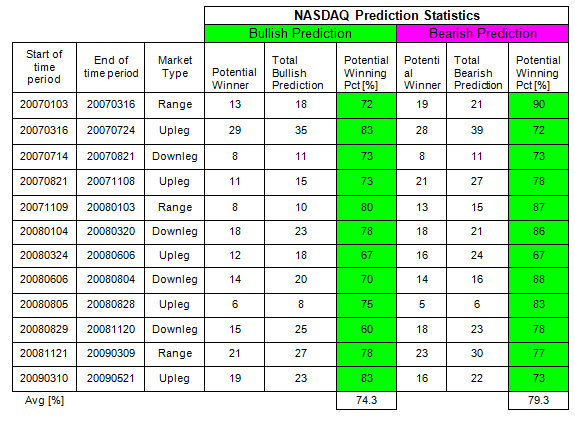 This was the only time period, when both the Bullish and Bearish prediction potential win probability remained below 70% for the NASDAQ and was at 70% for the S$P500. Interesting that during Range market the number of Bullish and Bearish predictions are roughly even, during uplegs we got more Bearish predictions than Bullish predictions, and during downlegs we got more Bullish predictions than Bearish predictions. It is because the predictor is more sensitive for the beginning of the day, and the market could close the day in the opposite direction relative to the prediction direction even on those days, when the prediction is a winner, using refined strategies. The other reason could be that in an upleg the up move concentrated in some limited up days, many times the market open down after an up day and the predictor is more sensitive to the opening period. During downlegs the situation is the inverse, after big down days the market often open up the following day at the opening period. We could make the conclusion, that the predictor performance is statistically similar during Uplegs and Downlegs. 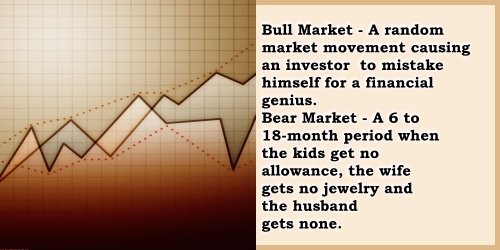 The same could be stated for general Bull markets and Bear markets. It is the individual trading strategy, that built around the predictor, which might bring different trading result in Bull market and Bear market, the predictor performance is the same. 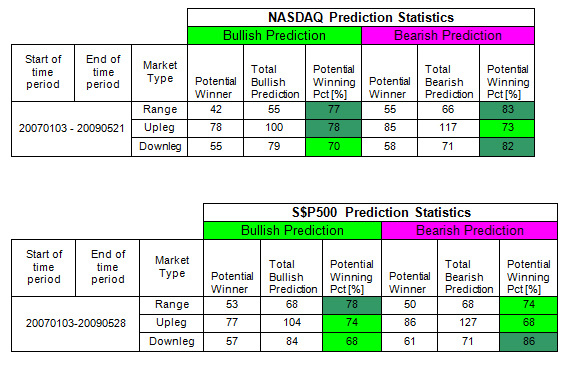 In case of a "Downleg", the difference between Bullish prediction Win probability and Bearish prediction Win probability is the biggest, 12% for the NASDAQ index and 18% for the S&P500 index. These are really meaningful differences and suggest to play the Bullish predictions in case of "Downlegs" with caution, using smaller position size for example for overnight positions and get confirmation from other analysis. During the days of the week we might be curious if the daily predictions has any meaningful relation to the day of week information. To see that we created the following table. Generally the NASDAQ Daily Prediction is a little bit More reliable than the S&P500 Daily prediction. So when we make our decision we might add more weight to the NASDAQ prediction, especially if the NASDAQ is the leading index from the two. On both indices the Prediction on Wednesday is the most reliable for the next business day. Monday, Tuesday, Friday predictions have about the same average win probability. The least reliable occurs on Thursday for the business day of Friday, on both Indices. Though the Friday - Monday is not the highest reliability predictions, it might still worth to play on a consistent basis, but not worth to play on limited occasions, having a bigger risk for GAPs against the predictor signal because of the longer period till the next business day. Actually the predictor is only able to predict market direction during regular trading hours. The predictor is Not able to predict the direction of the GAP (If any) for the next day. The prediction capability of the direction of the biggest GAPs was about 50 -52% during the Jan 2006 – Aug 2009 period which is basically no edge in the GAP direction prediction. Some of the biggest GAPs occurred on Mondays at the open. Those who desire to be in position during the weekends might better off playing futures as those are traded during weekend hours, so in case of extreme events against the position, those might be able to react earlier. Detailed statistics could be calculated only after we create our strategy on top of the predictor and calculate the performance of the trades having the detailed entry and exit conditions, position management setting defined. The weekly predictions have even better performance. These results are noticeable better than the prediction win probabilities for the daily predictions. It is also true for the weekly predictions that during Bull markets or Uplegs the Bullish predictions have a little bit even higher win probability than the Bearish predictions and vice versa, the Bearish predictions have a higher win probabilities during Bear markets or Downlegs. 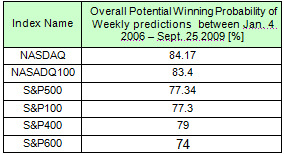 But for the NASADAQ index the Bullish weekly prediction performance between Jan 20 2009 and Sept 25 2009 is a whopping, extremely good 100%! That is all Bullish weekly predictions were correct, and only bearish weekly predictions failed 4 times during that Bullish period. For the S&P500 index the Bullish prediction performance was also excellent, with only one failed Bullish weekly predictions during the same period. To play all predictions with the highest potential win probability you need to focus on those occasions, when the predictions are not in the direction of the general trend on the given time-frame. In those cases you need to be more careful with your analysis and potentially give a bit higher then normal weight to other confirmations (classical technical analysis, Indicators, tools, services…) before making the decisions. All of these Daily and Weekly statistics includes all predictions during the calculation period, even those, not suggested to play for specific reasons, and those predictions having a Neutral bias and graded as level +1 or -1 with the given lower win probability. Since we have extensive trading experience in different time frames we try to estimate the importance of the different predictor time frames for your decision. There are no specific rules here. Every market player have different experience, trading or investing style, available resources and tools that might impact the importance of a predictor time frame. However some general guidelines might be useful to help your focus to turn to specific areas. - High importance. Even if you are not relying exclusively on the predictor information, neglecting this predictor information might cost above your risk tolerance level on a long term basis. So we suggest to take special consideration for this prediction, especially during the first 20 – 50% time of the given prediction period. - Medium importance. Probably you will not make your trading or investing decision based solely on this specific predictor time frame, but still might be very important supporting information, especially during the first 20 – 50% time of the given prediction period. It is always comforting to know for example that on a given time frame, which is longer than your specific trading time frame, the odds are with you or against you, having a specific position. - Low importance. The impact of this time frame for your yearly results might be small, be still not negligible. By better timing a specific position or taking it in line with longer term direction, the overall trading results could improve, even if it does only on a small scale for the average market player. If the predictions are different on the different time frames, that alone might be signal for caution and to stay alert during market action. 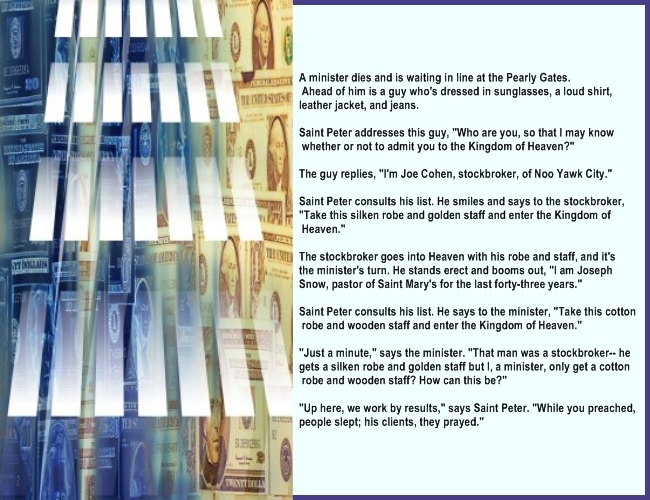 All three doing Day trading, but the opportunities they try to catch might differ meaningfully. The first group is the Group #3 doing 5 – 10 trades a day. This group of traders probably use the lover time frames, like the 1, 2 3 minutes time frames as their focus area of movements and accept to take profits on smaller moves, and take smaller risks at the same time, than those, trading less during the day. This might be profitable playing the market with bigger positions at a time. These traders are usually focusing less on the market structure. considering the number of swings at least 25 – 30 minutes long that are probably tradable following the market on the 5 minutes time frame on average we got 3.6 swings during a 5 month period between Jun. 2009 and Oct 2009. So if someone trading much more than the average daily swing count or trading much less might mean, that the trader is not trying to take advantage of major swings, but betting more on trending, which is rarely the actual daily structure, not even during strong general market trending periods. (Even though it is a matter of intraday trending quantification, we found that during the a strong Bullish up-trending market between April 2009 - Oct 2009 less than 10% of the days qualified as extremely strong trending days, which would be easy to recognize early on even by less experienced traders. We might have the best Day-trading results if we use the predictor information, trying to stay in synch with the market all the time, and also use other tools and resources to make our participation even more successful. Day-traders or overnight traders doing 0 – 1 trades a day might bet too much on one horse, and probably have to accept lower overall yearly performance. Yes the monitor time could be reduced this way, so does the stress level that need to be handled somehow. Is there any difference between the opportunities, available to us by opening the position before the close Today and close that position Tomorrow or opening the position only Tomorrow, after the open and close later in the day? There are meaningful differences between these cases, and the way how to play the Daily predictor information. But the overall performance results might not differ that much. Assume that we open a position at the market open, and close that position on the same Day at the market close, and we reach the ideal performance, so that we are 100% right on the direction of the market between the open and the close. That would mean for us, that about 1/3 of days would have generated less than 0.5% profit for us. Now how would this change if we take our position just before the market close Today, stay nimble 100% of the time as we manage to be correct in the market direction from Today’s close till Tomorrows close. Overall the results would be very similar during the past 18 month for the NASDAQ100. If we compare the two trading scenario, we see that the results are about the same, might be only marginally better if we are holding our positions overnight, but the risk is considerably higher for overnight traders. Not to mention, that most of the time predicting the direction of the overnight GAP is extremely difficult, even though sometimes it might be much easier than other times. The weekly and monthly predictor information help us a lot by giving the edge into our hands, so that the actual overnight risk might be smaller than otherwise, especially if we are about to hold positions more than one night. - Day-traders having no or limited trading experience. GAP against the trade by the next open, being so much negative impact, that could hardly be dealt with. movement at least 70 – 80 times a year might qualify as consistent play. Daily prediction, including all movements above zero. predicted direction much more than 50% of the cases till the market close at 4.00 PM ET. Some trading frequency offer more opportunity for traders than others. Some much more competitive than others. To be consistently successful as a scalper the focus needs to be more on the execution, on the trading platform that the trader uses, and less focus will be allocated to predicted market direction. Trading professionals spend considerable time preparing for the trading day. That preparation might depend on the type of strategy used for trading, the frequency of trading and many other circumstances. News writers and blog writers writing millions of pages on different things. All of them could be useful. But it takes considerable amount of time to read and to digest that and make proper conclusions. Most analysis starts with the indices, like the DOW, NASDAQ, or the S&P500 did this and that in the past. During the trading preparation try to focus collecting objective information, that is important for your strategy. The predictor also helps in this area. In contrast of reading hundreds of pages, market commentators, who comment on the indices how they behaved in the past, we are not spending that much precious time. We just read the predictor numbers, which takes seconds of our time and for us that is simply the most valuable information to start the day with. So we could allocate more time to other market research and software development. Everything the market as a total think and does is compressed into our predictor information. This information has the highest weight on our decision making process, but the daily, weekly and monthly prediction data for the indices not treated in isolation. They are considered in the context of the general market conditions. We need to know if the market is trending up/down midterm and longer term, or moving in a range. It is above or below the major averages, it is high or low volatility environment and how oversold / overbought the market currently. As a proximate information we like to see where are we on the different charts relative to the major averages and the Bollinger bands (MA20, Std2). We emphasize that the predictor information need to show its effectiveness relatively early. If we do not see the market tendency to move in the predicted direction in the first 30 -90 minutes (In case of the daily prediction.) sometimes much earlier, than it is a red flag, and might make us to revise the expectations and reverse positions quickly. We might state that many times the success level of the trader, using the daily prediction information will be highly dependent on how quickly he / she will reverse / flip the position. If for example we have a Bullish prediction and the market opens against us with a big gap (Above 0.8%) than it is a warning sign alone, and if the market continue downward in the first 5-30 minutes, suggesting a downward trending day, than we might not only close the long position, but consider opening a bigger short position. Before the market open we need to evaluate how old are the presented weekly and monthly predictions and taking that into account. Some of the biggest percentage movements occur when we actually have neutral prediction. So be alert, that the prediction information is not about the size of the move, it is about the probability of the direction. Most of the market days are not trending days. Many of the days have two or more swings during the day. The predictor information usually predicts the first major direction correctly, but of course the daily prediction is still valid till the end of the day. But having a bigger than 1% gap against our position at the open makes it relatively unlikely, that the position will be a winner during the day, even though that occurs a few times a year. Do not expect to be a pro predictor user overnight. It takes a few month to get a really good feel for the predictor information, but after that you will probably experience much less big surprises from the market. 2. Trading preparation before market open. profitable but probably not even close to our potential. predictor information exclusively, no matter how good it actually be. We also need to consider the other side of the market to get prepared against surprises. So we encourage to have the predictor as one additional tool to support your trading decision process, and stay open to other methodologies to evaluate market action and behavior. We, the predictor developers have a lot of time before market open, as the US market opens at 3.30 PM in Europe and closes at 10.00 PM, so we have the luxury to spend hours with market preparation. The predictor system is only part of a bigger system, that we started developing more than 10 years ago. In addition to the predictor the system calculates hundreds of indicators and other aggregate information for thousands of individual stocks and index components. This data also support our preparation before the market open. - Checking the economic news, scheduled and not scheduled news information. -Checking our other proprietary indicators. - View the charts of the most important indices, ETF/s on multiple time frames. Before the market open we would like to get a good feeling about the potential market behavior, especially in the first 15 – 90 minutes, which is usually the most dynamic period of the trading day. - The potential support and resistance levels, that might play important role during the day. - Other dynamics, that our analysis and detailed predictor data might reveal. 3. What If chart creation before the market open. Actually this is a very important and useful part of the daily routine that we complete. The predictor information and the data, collected during the preparation period supports this process, along with extensive market experience. We complete this just before the market open between 9.00 AM – 9.30 AM so most often the economic news and the behavior of the other markets already available for consideration. We start with the levels of the previous 1 -5 days, that the market visited, and with the pre-market levels as the starting points. We also draw the important support and resistance levels. Since the most probably direction of the market is available from the predictor data, that serves as a guidance to draw the charts and make potential What / If clauses at key levels. With this chart, created before the open, we envision the trades of the day, at least during the first 30-90 minutes of the market day before the market opens. The usefulness of this is really invaluable. 4. Actual market behavior before and after the market open. Nothing cut in stone in advance. After the market opens we need to evaluate its potentials as quickly as possible. Of course not. But we must evaluate the probabilities extremely quickly, as every seconds counts. Of course we need to operate within the conflict of time and probability. We need more time to get higher probability decision, but if we waste too much time, we lose potential opportunities. Because of these importance and limited time available the general rule is that the more automated your decision the more successful you can be during these period of market action. We also developed a range of supporting tools to aid this decision process after the market open. In addition to that we use a range of publicly available data, indicators to reinforce the market diagnosis process. - Absolute and relative volume and volume characteristics / volume profile. - Last but the most important for us is our proprietary indicators. We also have the Real time charts for both the NASDAQ and for the SP indices or their following ETF-s.
To get a better model of the real trading supply -demand we follow the indices or the index-following ETF-s on multiple time-frames at the same time. We use five charts for the same equity to see the developments on five different time-frames at the same time, even if our primary focus is on the 5 Minutes timeframe. You need to use the tools that you are comfortable with and proved to be good support information. No matter how good any tool can be, the consistently correct identification of the market behavior can be attained only with a lot of experience, and no one can escape that learning curve. Those who get a lot of good structured education in this matter might get to the master level much sooner than self educated entrepreneurs. The previous four points might be a little bit different for longer time-frame traders or investors, who might use different tools, chart patterns, fundamental analysis, cyclical analysis, Elliot wave theory or many other supporting methodology to aid them in their decision, and also their focus might be more on the weekly and monthly predictor information and considering the daily predictor only as a fine-tuning tool in their decision. 5. Analysis of the available data. This analysis is a short, split second analysis during market hours. envisioned when we created the What-If chart before the market open. After years of experience with the predictor we got to a confidence level that many times we are not waiting for the market to confirm our direction as it would be too late in the heat of the market open and would lose a big part of the predicted moves. At a time of neutral behavior we might easily enter in the direction of the predictor information. Other times, later in the day when the market is slower a bit, we wait for the market to confirm our hypothesis before we enter the market. Later in the day, before the close of the market if we are about to open a position for the next day in light of the predictor information, we just try to get into position by taking the best possible price during the last 30 minutes or so. This decision partly completed during the chart creation phase, what we complete just before the market open. At that time we consider specific price levels. After market open those levels and the position size might need to be adjusted according to the actual market behavior. One of the most important aspect of the trade is the position size, adjusted to the current market conditions. For those, who are holding position overnight one important aspect to consider is the closing of the position in multiple trades, in two or even three portion. This is because most often the opening market minutes shows wild fluctuations and it might be difficult psychologically to optimize the performance results. Closing only portion of the trade at a time might lead to better results. Our analysis actually showed considerable differences in the results if the overnight positions closed in two or even better if closed in three potion (obviously not always needed), letting the real winners run more. In case of a very small overnight position it might not worth to split into smaller portions. We note that in some cases it might be good to initiate trades before the market open or after the market close, assuming that our analysis and the predictor information strongly support that idea. regular market closed but we have a strong predictor information which points to the other direction the next day, and have no prohibitive information ahead of us (Like crucial economic data before the next open or important profit report from market leader companies…) than we might take a position after the regular market close getting a better price. position before the market open. 15 % of all predictions for a specific index will be in the Neutral category. 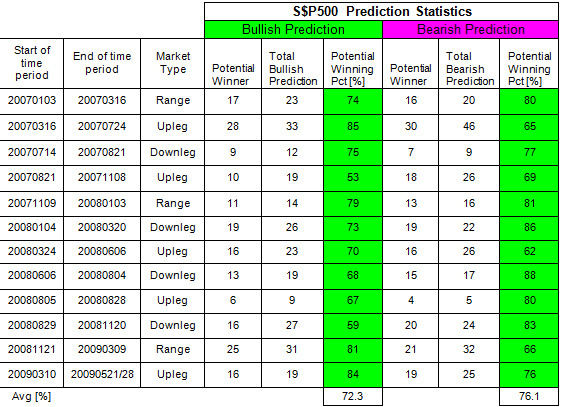 70 % of all predictions for a specific index will be in the “Bullish” or “Bearish” category. The absolute measure is the Win probability percentage, that we present, but the grade of the prediction will be relative to overall win probability distribution. Over time we might adjust the grading levels a bit. The grading, so called cut levels might change, but the win probability will be calculated automatically, as we can’t touch that information. If we compare the win probability of the indices for daily and weekly predictions we se notable differences between those values for the same index. Though we got very high win probability for our daily predictions the win probability for weekly predictions might be even 5 – 15 % higher for the same index. According to the information available for us currently our weekly predictor is by far the best system ever developed to predict the movement of these indices in that time-frame. To see the performance details please download the historical weekly predictions and the prediction charts from the download section and analyze the details for your preferred indices. It is just because of the performance, that we grade a 80-90 % win probability for the NASDAQ weekly prediction for example as “Bullish” or “Bearish” whereas a much smaller win probability by other standards considered “Extremely Bullish” or “Extremely Bearish”. 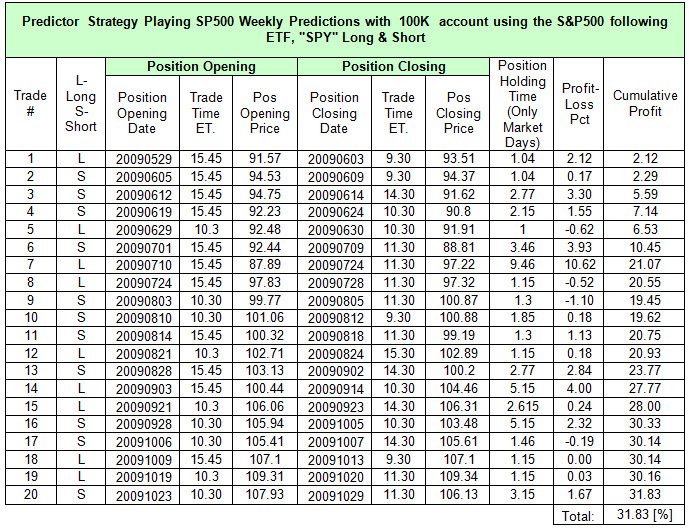 These numbers suggest that when we design our strategy and select our timeframe to use the predictor information the weekly predictions probably will have a fairly high impact / weight on our decisions. The first part of this exercise might be that you start evaluating your experience, market and trading knowledge, your time, that you plan to allocate to the markets, your risk tolerance, your frequency of trading, your capital allocation strategy, your portfolio management strategy, your preferred asset class to express yourself and your opinion on the market, your profit objective, your detailed entry and exit strategies. Obviously the above mentioned items are not completely independent variables. It is also important to take into account what kind of other tools, services and supporting information available for you to build your trading strategy upon the predictor information. Based on this and the predictor an unlimited number of successful strategies could be devised. Regarding the predictor information you need to answer a few questions, that will be important during the strategy that you design. Will you play every predictor information, no matter how strong they are, or you will be selective? Remember there might be quite a few days during a year, when the risk to take overnight position might not worth to take it. Some of those related to coming economic data, profit reporting and other news or technical analysis conclusions. But out of more than 250 trading days a year, at least 55-60% of them could be considered lower risk plays for overnight positions. If you are selective, will the selection be a complex decision algorithm, or a simple predefined decision mechanism or a more intuitive decision mechanism? Will you play every potential opportunity with the same size or the selection of your position size will be determined by market conditions, predictor data and / or other complex mechanism? Will you plan to play only the Long side, only the Short side or both sides of the market? Remember, the predictor win probability for Bullish / Long positions is higher during up-trending markets while the predictor win probability for Bearish predictions is higher during Bear market periods or down-trading periods. Considering the longer time span it never paid to go against the market for extended periods of time. For example during the past 10 year period we had only two occasions when the market had longer down trending periods from Sept. of 2000 and from Aug of 2008. Excluding these periods the average correction periods in the market was about 5 -6 weeks. Overall the market spent only about 20% of the time with corrections and about 80% of the time with general up trends or range markets. Overall the predictor considered equally good during any market conditions, and the performance is similar during Bull and Bear markets. Will you select your position size or allocation differently in Up-trending / Down-trending / Range markets? Actually we use only two distinct strategy based on the predictor information. 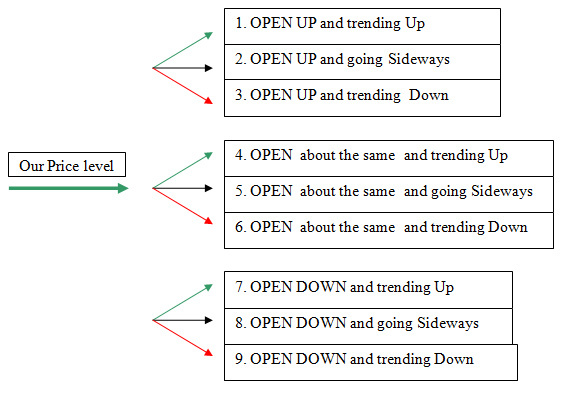 The first one is used in case of trending markets and the second one applied during range markets. Because of these it is important to make the distinction between these two as early as possible after the market open. During the preparation period for a specific day we collect information regarding which type of market (Trending or Range) has higher probability for the coming day to play out. Are you generally playing all market environment? Trending markets, Range markets, Breakout markets, high and low volatility markets? What will be your main timeframe? Will you plan to hold position(s) overnight? Many trader try to play at least two-three different time-frames until they resort to a preferred time-frame, on which they can focus the trading effort. For beginner and novice traders we would not recommend playing multiple time frames and / or multiple asset classes at the same time, but professional traders might exploit market opportunities this way very successfully with more complex strategies. Remember, that a Bullish daily prediction means, that prices expected to be Up during the next day, relative to close level of the previous day. It does not necessarily mean , that prices expected to move up relative to the opening level, especially during big gapping days. Similarly for weekly and monthly predictions the reference price level is the price level at the time of the prediction even though we use the Daily closing prices for the classification or correct / False Daily prediction. Do you plan to open / close the traded position all in one or you try to scale in and even more importantly scale out of your position in multiple installments? Our statistics show that much better results could be achieved by short-term traders if the positions closed only partially at a time, even though in some cases it might be optimal to close the whole open position in one trade. Do you plan to have the potential trades executed automatically, using an automated trading system or you plan to execute those trades manually being an intuitive trader? We would not suggest to build the predictor information into automated systems without spending at least 4 – 8 month with the system in addition to completing a slew of analysis on the available data. Currently we did not build direct automation support into the predictionwizard.com WEB-portal. Do you plan to play the market reversal opportunities? To reach the maximum potential of a strategy built around the predictor it is very important to learn those situations, when the predictor information proves to be incorrect, and react to those events quickly and decisively. Many times this decision could be made as early as in the first 10-30 minutes of the market day, and most of the cases it is obvious 30-90 minutes after the market open. Remember the predictor power will decrease over time, and it will predict the moves during the first 10 -20% of the predicted period with the highest win probability. This means roughly the first 30-90 minutes in case of a Daily prediction on the next day after the open. In total this average trader has 75 – 50 = 25 win units during these 100 trading days, assuming that the win units are equal to the loss units, which could be normal assumption in case of overnight positions. A more experienced trader who wishes to turn some of those loser days to winners by reversing positions after the incorrect prediction information identified by closing the losing positions and opening contra positions with even bigger size can have the following results. If turning 3 big losers to small winners and 5 average losers to 5 average winners. In total this above average trader has 82.5 – 36 = 56.5 win units during these 100 trading days, assuming that the win units are equal to the loss units, which could be normal assumption in case of overnight positions. The difference between the results of these two traders is really big, actually the more experienced trader produces more than two times the profit of the less experienced trader during the 100 day period just by turning initial losses into profits in some cases. None of these results are extraordinarily high results, these are presented only to emphasize the importance of playing the market reversals or the days, when the predictor information proves to be incorrect. Some of those days still could be profitable days for the best players. We stated throughout the learning material, that the consistently successful use of the predictor requires some trading experience. The more the better. We can also add that much more trading experience required, if the predictor is used to support short-term trading, like intraday or Day trading activity. In that case the constant diagnoses of market internals, market pulse has much higher importance to stay in synch with the market while applying the edge, the predictor gives into our hands. The question, how good is our edge could be detailed only if we create a detailed strategy using the predictor, apply that strategy on the market and verify the results, and compare with the actual index movements as reference levels during a specific test period. To demonstrate the edge of the system we present a very simple strategy, that uses the predictor information, a strategy, which does not require to spend 3 – 6 month to understand the predictor mechanism and its professional application and still pretty effective. Even though we have the highest win probability on the NASDAQ index predictions, in this example we use the S&P500, and its following ETF’s as trading vehicles. We use the S&P500 following ETF, “SPY” for our example and also present the sample trades, using the S&P500 following Ultra ETF, the SSO, which on average moves up 2% during a day, If the SPY moves Up 1%. - If The Weekly prediction, and the Daily prediction for the S&P500 points to the same direction (Both of them points Upward, or downward) then we open the position in the predicted direction on Friday at 3.45 PM, which is 15 minutes before market close. - If the Weekly predicted direction for the S&P500 is different than the Daily predicted direction, (That is the weekly prediction is Bullish or Neutral positive and the Daily prediction is Bearish or Neutral Negative OR the weekly prediction is Bearish or Neutral negative and the Daily prediction is Bullish or neutral positive) than we open the position in the Direction of the Weekly prediction, but only on the Next week, 1 Hour after market open, which is 10.30 AM ET. - We apply a 1.5% Stop level on the Index, on SPY, and 3% Stop level on the Ultra S&P fund, the SSO. If the STOP activated, that will be our exit point. The main exit strategy will be the crossover of two Averages, the WMA10 and the SMA10 on the 60 minutes chart. If we have a Long position, and the WMA10 crosses the SMA10 from above to below, than we exit the Full Long position. Similarly If we have a short position, and the WMA10 crosses the SMA100 from below to above, than again, we exit the Full short position. - If by the Next Friday, we did Not exit the position, and the Weekly predictor point again the same direction as our position, so the same direction it pointed the week before, when we opened our position, than we keep the position running, do not exit. 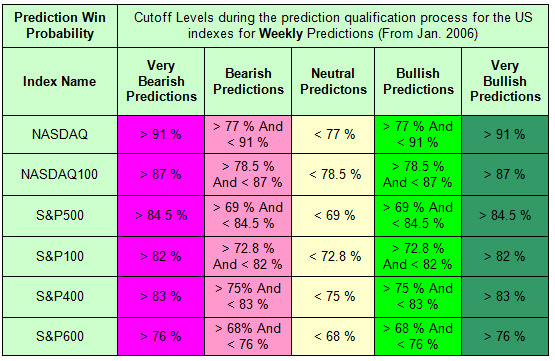 depend on the Weekly and the Daily Prediction information, available on Fridays. To evaluate the performance of this strategy we use a constant 100 K Account size. The profit results will not be reinvested, so that all trades will be using the full 100K starting position size. As we can see this very simple strategy gave us a nice results of 31.83 [%] or 6.366 [%] on average during a month. 1.06366 raised to the exponent of 12, which would result in an account size of 209 071 $ after 12 month period, a 109.071 [%] profit level. During this strong Bullish period the market, SPY moved up less than 15 [%]. Another information that during this 5 month period this sample system never stopped out. Again, we used a 100K trading size for all trades, without reinvestment. If we would reinvest the generated profit, than a monthly average performance of 12.85 [%] would result in a trading or account size of 426 597 $ after a 12 month period, starting the period with a 100 K size. That would probably be well above the yearly performance of 99% of market participants. We know that past performance results are not guarantee that futures results will be similar. This simple strategy could be improved noticeably by focusing on the market during the trading day. Especially on Monday’s the first 2 – 4 hours could be very important, as it impacts the total profit level the most. It does not apply any refined position management idea, that is otherwise supported by the available predictor information. It also uses the Daily predictor information only for Mondays, but it could be a bit more refined, using more Daily predictions, at least those, that are in the same direction as the market’s current direction, or the MA20 average direction on the 60 minutes chart. This strategy does not use any support - resistance level analysis, which could improve the overall results. Every time the strategy is not yet winner and the WMA / SMA crossover appears, we might consider flipping / reversing the positions to increase the potential results even further. But that action might need real professional analysis of market internals. Overall it might serve as a good starting point, and it could also be considered by those, who have less than a 100 K available trading capital. The number of trades during this 5 month is very small, only 2 * 20 = 40, so the brokerage fee, associated with this strategy would be much less, than trading the Daily predictions and having 3 – 10 round of trades a Day, which would result in 600 – 2000 trades during the same market period, and much higher brokerage fee. The time, spent with trading might also be important for busy individuals. To execute this strategy, someone need to check the value of the shares once every hour, at the end of each hour. If let’s say it takes 30 seconds at a time, then to follow this strategy would take 7*30 seconds, or about 3.5 minutes of time every day or about 6 hours during this 5 month period. That kind of time investment, compared to the potential return on the investment is a pretty good number, time well spent. If we have more time to spend in front of the trading system, than the potential profit improvement might be noticeable, especially for more experienced traders.